With the snowstorms and snow-melts that we have recently experienced in Maryland you may have noticed gray or straw colored circles of matted grass in your lawn. These spots may be the result of snow mold. There are actually two types of snow mold, gray snow mold and pink snow mold, caused by two different funguses, but they share some similar characteristics. Both start growing in winter, under the cover of snow at near freezing temperatures, but may continue spreading and growing after a snow melt up to a certain temperature, and as long as the grass is wet. And the symptoms of both are the appearance of gray circles of matted grass on the lawn. There are differences however. Gray snow mold is caused by the fungus Typhula spp. 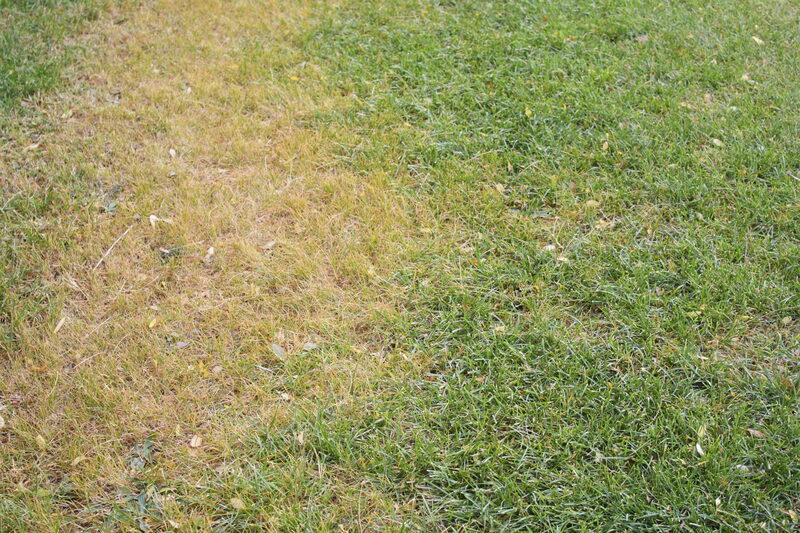 Gray mold is gray or white in appearance and only attacks the blades of the grass. Gray mold may form sclerotia, the hard dry spherical structures that gray mold forms when it goes dormant, on infected grass. Sclerotia can be identified as small roughly spherical gray beads. Gray mold grows between temperatures of 32°F to 45°F or until the ground dries. Pink snow mold is caused by Microdochium nivalis and infects the blades and roots of grass. Pink mold is identifiable as white or pink in color. Because it attacks the roots as well the blades of the grass it’s more damaging then gray mold. Pink mold also grows in a wider temperature range, from 32°F to 60°F. How Can You Treat or Prevent Snow Mold? Unfortunately, the only single fungicide for treating snow mold, PCNB, has been blocked for sale by the Environmental Protection Agency. A mixture of other fungicides can be prepared for treatment; however, it’s not economically practical for residential homeowners to prepare this blend. Unless you hire a lawn care service like the Atlantic Maintenance Group, you can only wait for the temperatures to warm, and for the snow mold to return to its dormant state. The best you can do is to gently rake patches of grass that have been infected by the snow mold. 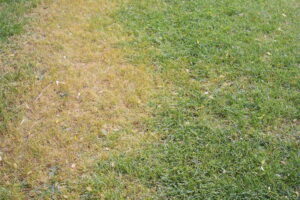 The grass where there was gray snow mold will green again, albeit slower then the rest of your lawn. The areas that had pink snow mold might need to be reseeded, due to the fact that pink snow mold can damage the grasses roots. Fortunately, snow mold is preventable. Be careful about nitrogen fertilizer you use on your lawn in the spring, summer, and fall. Using too much can help snow mold grow. Keep mowing the lawn and bagging, or raking, the clippings until it is too cold for the grass to grow. Raking leaves and keeping the thatch layer short both can help prevent snow mold. Before winter a fungicide may be sprayed in October and November as a preventative measure before the winter begins. And finally during the winter, spreading the snow drifts evenly, so that they don’t clump, can help alleviate the appearance of snow mold. If you have snow mold or have any other winter lawn care questions the Atlantic Maintenance Group can help. Atlantic Maintenance Group is a full service landscaping company, providing maintenance, design and construction, as well as snow removal, asphalt and concrete services. We are your source for complete landscape and facility maintenance for commercial and residential properties throughout Maryland, Virginia, Pennsylvania and Delaware. We are a self-performing landscaping company, meaning we don’t hire subcontractors, and senior management is involved with every project. Our highly trained team of professionals receives constant, ongoing education on the latest industry trends, updates and safety measures. This ensures we can deliver outstanding customer service and results to our clients, regardless of the size of your job. If you have any questions about outdoor lighting, or to get your free quote today, give us a call at 410-768-4720 or contact us via our website or follow us on Facebook, Twitter, Pinterest, and Google+ to see how we’re growing! This entry was posted on Wednesday, February 4th, 2015	at 6:44 pm	and is filed under Curb Appeal, Lawn Maintenance Service, Lawn Tips, Snow Mold	. You can follow any responses to this entry through the RSS 2.0	feed. Both comments and pings are currently closed.